General Hospital (GH) spoilers tease that Carly (Laura Wright) will resort to scheming next week, December 25-29. She’s been trying to help Sam (Kelly Monaco) see the light regarding the Jason (Steve Burton) situation. Carly believes Sam’s shutting the door on her true soul mate and that’s something she just can’t handle. As a result, Carly will take drastic action. She’ll do something sneaky on December 28 and Drew (Billy Miller) will have some car trouble the following day. Port Charles will be gearing up for New Year’s Eve celebrations, so this could give Jason and Sam the chance to be together. Will Carly be at fault for Drew’s vehicle breakdown? No one would be surprised if she stooped that low for matchmaking. Drew will grow frustrated over his bad luck, but he may need to blame Carly! If Carly’s responsible, she’ll definitely get caught and face major backlash. In the meantime, Jason will talk to Sam (Kelly Monaco) about a few of his regrets. He may be sorry about some of the things he did before he was held at that clinic in Russia. Jason might want to properly convey how much Sam meant to him then and means to him now. He intends to respect Sam’s decision to be with Drew, but he’ll still feel like there are some confessions to get out in the open. General Hospital spoilers say Jason and Sam’s bond will strengthen. Carly will be pretty pleased with herself if she’s the car sabotage culprit. She’ll feel like her plan is working like a charm. However, it’s almost impossible to get away with secret plots in this town. It won’t be long until Jason points the finger at Carly. Jason may hear about Drew’s random car trouble and put it together with a hint Carly drops. GH fans can expect a fierce faceoff in an upcoming episode. 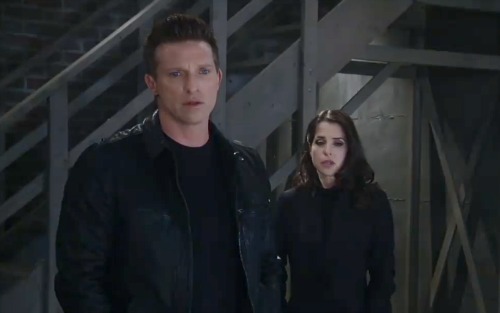 General Hospital spoilers say Jason won’t be happy about Carly’s constant meddling. He’ll track her down and demand some answers. Carly may admit she’s been plotting behind Jason’s back, but she’ll undoubtedly argue that it was for his own good. Naturally, Jason won’t have the same perspective. He may tell Carly that enough is enough. Jason will likely push Carly to mind her own business and let him deal with this is way. Will Carly back off or just rev up her efforts anyway? Love and friendship are certainly getting complicated in Port Charles. We’ll give you updates as other GH news comes in. Stick with the ABC soap and don’t forget to check CDL often for the latest General Hospital spoilers, updates and news.